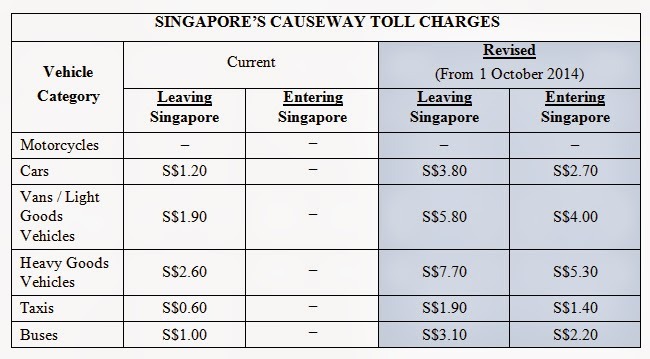 If you have not already know, Singapore's LTA (Land Transport Authority) has announced the revised toll fee for leaving and entering Singapore through the Causeway. It will take effect from 1st October 2014. All vehicles are affected except motorcycles. 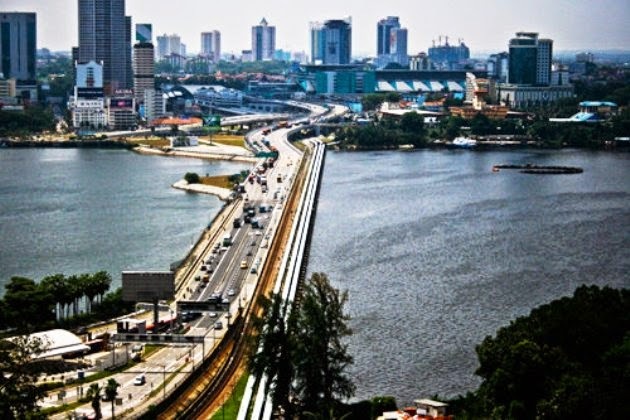 On a related note, Singapore had raised the Vehicle Entry Permit fees for foreign-registered cars from S$20 to S$35 per day, and the Goods Vehicle Permit from S$10 to S$40 per calendar month since 1st August 2014. On yet another related note, Malaysia's government also raised toll charges that same day by more than 400 per cent. As you can see, if you are driving car to Malaysia (say, going to JB for weekend getaway), currently you only need to pay SGD1.20, comes 1st October 2014, you are expected to pay SGD6.50, which is more than 5 times the current charges. I predict no impact on traffic. It just means more revenue for the Johor Govt.